AES has been in business since 1987. As a result, thousands of teachers have used our digital curriculum systems to revolutionize their classrooms and help their students learn. But what have they done, specifically? And what have they done that you can do as well? We’ll start with the #1 most common area that teachers want to improve — certification prep. Luanne Scharkozy is a health science instructor in the School District of Osceola County, Florida. Originally a registered nurse, Luanne transitioned to teaching because she was “itching to do more” to help the next generation of healthcare workers. But because Luanne came from the healthcare industry to teach — as opposed to being an academically-trained educator — she ran into some obstacles in the classroom. The biggest obstacle was preparing her students to take the certified medical administrative assistant exam (CMAA). To improve pass rates, Luanne used AES digital curriculum in a blended learning environment, using elements of lecture, group work, computer work, homework, and classroom discussion to enrich her students’ education. Griselle Figueroa-Martorell, Luanne’s supervisor, shared the results. Clearly, Luanne’s blended learning approach worked for her students. If it worked for her, it can work for you too! You can read her whole story for yourself! No matter what you teach, the odds are strong that you have certain state standards that you have to follow. Standards are created with good intentions — they help provide a consistent, quality education to all students throughout a state. In practice, they can be a bit of a headache. This is especially true if you’re creating a brand-new curriculum and you’re stuck “translating” checklist items from standards into actionable syllabus ideas. By the time you’re done, you can sink dozens of hours into syllabus planning just to ensure you’re covering state standards. Thankfully, there’s a simpler way to approach standards in general! Sharie Cato and Sue Ellen Shealy teach in South Carolina. They needed to create a certified nursing assistant (CNA) program that adhered to South Carolina’s strict standards while also providing the information that’d help their students in real-world careers. They found the ideal middle-ground with AES digital curriculum. While administrators may not like the idea of “canned curriculum,” the fact of the matter is that pre-made curriculum resources can play a crucial role in adhering to state standards, improving student learning, and making teachers’ lives easier all at once. For more on how Sharie and Sue Ellen teach, you can read their story for yourself! Blended learning is a big buzz word in education, especially in middle school and high school. The gist is that you use a variety of teaching strategies to accommodate all of the different learning styles that make sense to students — lecture, hands-on, reading, group work, projects, presentations, and more. Patricia Carter, a middle school teacher in Georgia, introduced blended learning into her classroom in order to help her students better understand the Internet. This initiative helped many of them grasp a variety of concepts, and Patricia continues to embrace blended learning as more technology and ideas become available. Patricia specifically uses AES’s business education curriculum for pre-test vs. post-test evaluation, which she says gives her a great idea of how much students have grown in a particular subject. Patricia even includes this data into her grading scale, allowing her to more fairly evaluate students based on the progress they make in her classes. In her words, it helps hold her students accountable for their own growth — even at the middle school level. To learn more, you can read Patricia’s story for yourself! Differentiated instruction is the practice of accommodating a variety of learning abilities in one classroom, including IEP and ELL students. Differentiated instruction is often difficult because of the number of variables that you have to cover ranging from learning disabilities to “gifted” students and beyond. It comes down to the age-old teaching question — how can you help the students who are struggling in your classroom while engaging the students who are working ahead? Edina Buzgon of Delaware faced this same difficulty. For Edina, the biggest advantage of AES digital curriculum was the variety of instructional materials it offered. She used digital lessons, printed worksheets, and hands-on projects to create largely self-directed instruction that students could follow. Then, Edina acted as a learning facilitator. She looked at student data to verify that they were all learning to the best of their abilities while giving them a sense of ownership in their own education. With this approach, Edina can spend her time with the students who need special attention the most. As other students pull ahead, they’re continually engaged with new lessons, activities, and projects as well. Edina’s classroom answers that age-old teaching question with technology and keen teaching instincts. To read her whole story, check out her case study! Classroom management is one of the hardest parts of teaching. The best way to learn it is through experience, which means newer teachers have a hard time getting a good classroom management strategy under their belts. But with AES digital curriculum, classroom management becomes much simpler. Take Bernadette Lindsay, for example. Bernadette teaches more than 400 students every year from her classroom in Southeast Guilford Middle School in North Carolina. She has to teach computer applications to North Carolina standards while ensuring each of her 400 students has the chance to thrive academically. Instead of taking the pen-and-paper approach, Bernadette chose to use AES digital curriculum to enroll, track, and grade her students automatically. This saved her hours of extra work over the course of her year while simultaneously allowing her to introduce differentiated instruction and blended learning. Bernadette found that the video, audio, graphic, and story-driven elements of AES curriculum helped her students learn while keeping them engaged for whole class periods. The end result is a streamlined classroom that helps hundreds of students learn while letting Bernadette maintain her sanity. For her, it all comes down to how AES digital curriculum works. Read Bernadette’s case study for yourself! Individual student pacing is the practice of setting a specific learning sequence for individual students to follow according to their needs. While differentiated instruction is one method of accommodating students who require customized curriculum, many students require active attention in order to learn properly. Commonly, this is done by setting individual pacing options for different students. Patricia Smith, a health science teacher from South Carolina, uses AES for this exact purpose so she can work with students who have reading disabilities. AES’s digital curriculum includes narration, ensuring students who have common reading impairments — like dyslexia — can still get the full value of a lesson. Patricia shows her students how to use this feature while encouraging them to work ahead or take their time, as they feel it’s necessary. The results have stuck with Patricia — and her students. For Patricia’s full story, read her case study! Student remediation is another big challenge for any teacher, regardless of grade level. Aside from the fact that it requires you to spend extra time customizing remediation plans for individual students, it’s made even more complicated by how remediation is perceived among students’ peers. Not only do you have to do extra work — students may not even want remediation because of the stigma attached to it! Mark Rodgers of Jupiter Middle School had this same problem. Mark found a solution in AES digital curriculum. Instead of directly tutoring struggling students, Mark opted to have them go back through their AES lessons to prove that they’ve properly learned a subject. For students, this is important because it means they can do remediation work at home where their peers don’t have to know. Best of all, Mark doesn’t have to grade any hand-made exams or worksheets — all of it is tracked in his AES account. With the 24/7 accessibility of AES digital curriculum, Mark knows that his students have the capability to go back, re-take a lesson or assessment, and show improvement practically overnight. As Mark and his students discovered, you can access AES curriculum with any Internet-connected device — including a smartphone. That alone has revolutionized the way his students perceive remediation specifically and learning in general. You can read all of Mark’s story here! Data reporting is one of the most-used and least-understood phrases in education today. The reason is because it has a lot of expectations surrounding it, but those expectations can vary by state, district, and even school. So what “data” do people actually need to see, and how is it supposed to be presented? For the most part, “data” refers to any numerical indicators that students are succeeding in their classes. That could include grades, participation, and even completion. Patricia Carter, the same teacher who had so much success with implementing blended learning via AES curriculum, has fully embraced the data opportunities that AES offers. Patricia uses AES data reporting to track student activity and communicate with parents, administrators, and other teachers. Most often, Patricia said she finds herself using this data to show parents why their child may have received a zero for a certain assignment — even when the child says they did the work! As Patricia can endorse, numbers don’t lie. Those same numbers can be used to satisfy administrator requests about progress, particularly when it comes to certification rates. For more on Patricia’s story, check out her case study! Let’s all be honest with each other — creating lesson plans is a pain. Whether you’re making your first or 100th lesson plan in your career, it takes extra time outside of regular school hours for you to get everything together. Then, you have to refine the lesson plan over the next few marking periods to make sure it actually works the way you want it to work. And remember certifications and state standards? There’s so much that goes into lesson planning, and it’s accepted that you’ll do it — even if it takes your weekends for the next two years! Tyler Page of Brantley County Middle School had this same problem. Among other challenges of teaching health science at the middle school level, Tyler ran into the obstacle of planning, revising, and trying his own lessons for every single part of his class. It took up a lot of his free time. As a husband and father of two, that meant Tyler lost a lot of time he could spend with his family. That’s why Tyler loves the pre-made lessons, assessments, and other resources in AES curriculum. While so many other challenges on this list are related to students, it’s important to remember that your health and wellness are just as important. If you’re burning out on lesson plans and pen-and-paper grading, you probably won’t be at your top performance when you’re teaching. With AES digital curriculum, you can take care of your class, teach your students, and regain your family time all at once. Read Tyler’s story for yourself! Try AES Digital Curriculum for Yourself! You’ve seen the best ways that teachers use AES digital curriculum to succeed in their classrooms. Whether you’re teaching a 10-student health science course or a 200-student computer applications class, AES digital curriculum is designed for you to succeed. That’s why we offer teachers 30-day free trials of our curriculum! Once you start your trial, you’ll be asked via email to verify your email address. When you log in, you’ll have the chance to validate you’re a real teacher (as opposed to a sneaky student). Combined, these tasks take about 30 seconds to complete, and they’re the only “busy” work you have to do to get started. Once you’ve done both items, you can create a class, enroll your students, and start teaching! 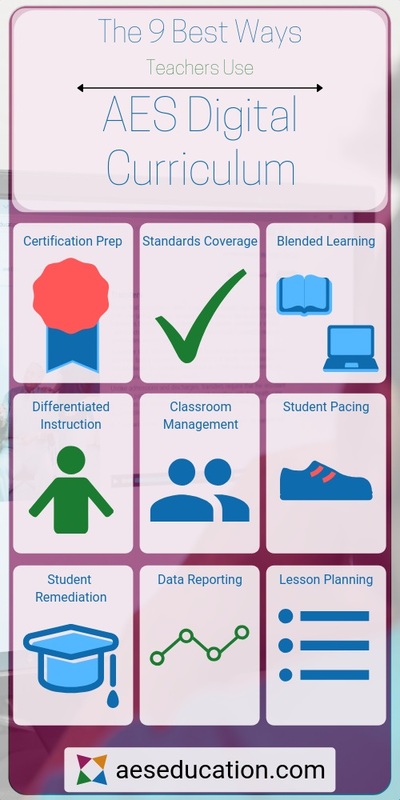 Are you ready to use AES digital curriculum in your classroom?